Professing Sociology was originally published at a time when sociology commanded widespread interest and public funding. Written by one of the leaders of "the new sociology" of the late sixties, this volume captures the nature and intensity of the field's intellectual foundations and scope. 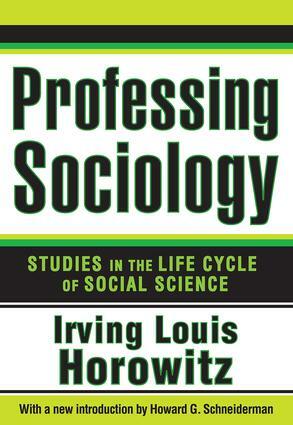 It reveals the field's post-World War II development as a scientific discipline and as a profession, and includes the author's most significant writings on critical trends shaping the field.Irving Louis Horowitz divides the life cycle of sociology into three main sections. The first deals with the inner life of sociology, covering basic theoretical issues uniting and dividing the profession. In a second section, Horowitz shows the institutions and sources from which the struggle of ideas is nourished. A third section shows how political life shapes the inner life of American sociology. Horowitz gives a great deal of attention to international social science, to the relationship of social science to public policy, and to federal projects and grant agencies and their effects on research.Irving Louis Horowitz was undoubtedly influential in shaping his field, and Professing Sociology offers valuable insights into how ideas become part of the fabric of professional life. As the new introduction by Howard G. Schneiderman shows, Professing Sociology provides a clear picture of sociology at the height of its importance.